Besides common symptoms of menopause, such as hot flashes or mood swings, some women complain of a hot sensation in their mouth. This bothersome symptom is often primarily associated with a burning mouth syndrome (BMS), which is characterized by pain and burning throughout the mouth, but a hot mouth sensation can also be caused by a number of other conditions. Read on to get a clearer understanding on why your mouth feels hot, what symptoms are involved, and what solutions you have at your disposal. The causes behind a hot mouth sensation are not always fully understood. Many of the below-listed medical conditions have been associated with this symptom, but in many cases, science has not identified the exact mechanism. Most women, a hot mouth sensation is a painful symptom. It is usually described as burning or scalding, and it can be experienced in all parts of the mouth from the gums and tongue to lips and roof of the mouth. Sometimes, a hot mouth sensation is accompanied by dryness, which can cause more irritation, affect the ability to speak, and diminish taste sensation. Some women suffer from a hot mouth sensation only occasionally for short periods of time, while others might struggle with it every day for months or even years. Moreover, it is very common that symptoms intensify during the day and lessen during the night. The best approach to managing a hot mouth sensation is treating the underlying condition to eliminate the symptom. For example, it might involve balancing estrogen and progesterone with hormone-regulating supplements, phytoestrogens, or hormone replacement therapy. In case of vitamin deficiency, vitamin-rich food sources or supplements can bring their levels back to normal and cure a hot mouth sensation. Other diseases known to cause this symptom might involve other, usually, pharmacological treatments. However, sometimes the treatment of a hot mouth sensation is not easy, because the causes are either unknown, as it often happens in case of burning mouth syndrome, or the conditions are untreatable, such as nerve injuries. In such scenarios, the emphasis is placed on alleviating the symptoms with numerous natural remedies and medications. Research has shown that avoiding alcohol and cigarettes, as well as maintaining a healthy and balanced mental state, can make women less vulnerable to experiencing a hot mouth sensation. Stress-reduction techniques, such as breathing exercises or yoga, have also been shown to reduce unpleasant menopausal symptoms, including burning mouth. If a hot mouth sensation is too overwhelming for you, it might be useful to check out some natural remedies to relieve your symptoms. Regezi, J., Sciubba, J. & Jordan, R. (2017). Oral Pathology: Clinical Pathologic Correlations. Elsevier: St. Louis, MO, USA. 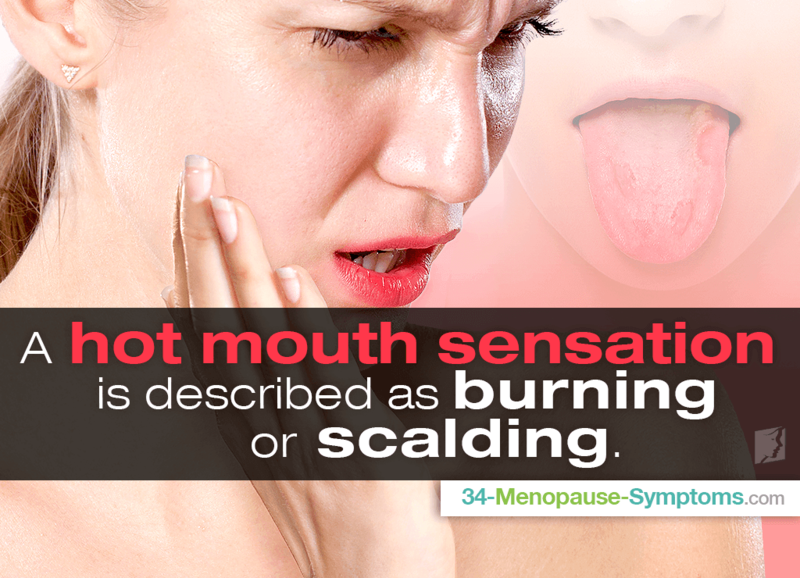 Burning mouth syndrome is one of the less well-known symptoms that can occur during menopause, but just as frustrating. Find out more here.